I love Adobe software -- but it's expensive. And when all you need to do is combine a few pdf files, you really don't need all the bells and whistles (or the pricetag) of Acrobat Professional. Enter one of my new favorite free tools: FoxyUtils. FoxyUtils is an online program that lets you merge, split, unlock and protect pdfs for free. It works on both PCs and Macs, which is a big help for those of us in the Apple world. If you sign up for a free account, you can merge files up to 50 MB; if you don't want to sign up, you can still merge files up to 30 MB. If you need to combine even larger pdfs (up to 200 MB) and want to enjoy the benefit of viewing the site without ads, you can set up a paid account for $4.99 per month. This program saved me endless time and hassle last week when I needed to combine several large pdfs into one file for a client's CreateSpace book. I haven't used the other options (unlock or protect) yet, but expect I will in the near future. Have you used this resource? Got another favorite online freebie? Let me know! 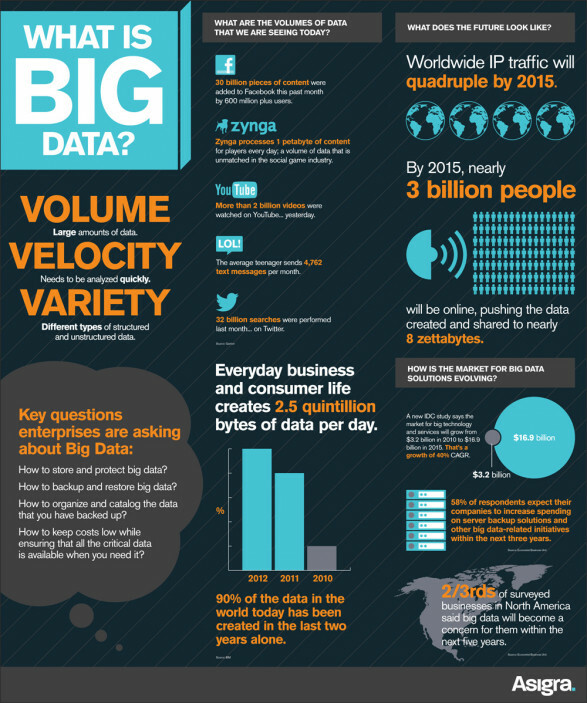 Just What Is Big Data? Big data is hot -- and getting bigger fast. Just what is it? Here's a great infographic from Asigra that helps explain this concept. A new survey of more than 1,500 B2B marketing professionals found that their #1 challenge in 2012 was creating enough content. What does this mean for 2013? More opportunities for content writers. This finding is probably no surprise to most marketers -- most of us just can't find enough hours in the day to create all the content we need. However, it suggests that more companies will be looking to outsource some of their writing needs through freelancers -- and through services like Elance, oDesk.com, Fiverr and Guru.com. The survey and article by Social Media Examiner also explore other major content marketing trends for the coming year. Does this match with your experience? Do you expect to outsource content marketing this year? Leave your comments below! So excited to share this guest post today from my friend and former colleague Gail Van Wart! Fresh out of college and ready to roll. Business ideas have been brewing for a couple of years and you just can’t wait to get started. You finally merge onto the highway only to discover, a short way down the road, all your passion and education will run into a roadblock if you don’t know when and where to change lanes. The road to success has to be traveled with creative marketing and flexible planning. Planning is a must. Yes, you’ve heard that before, and as long as you are in business, you’ll continue to hear it over and over again. It’s important to know what your goals are, and, perhaps even more important, to know when to change them. A good plan is a plan that works. If your plan is not working out as well as it looked on paper, it may be time to haul into a rest area and take a better look at your road map. Sometimes, all you may need to do is take a little detour, other times you could realize you need a whole new route. Don’t be afraid to admit it if you took a wrong turn, that’s the only way you’ll be able to change directions and reach your goals. Marketing is just as important as planning. Without it your plan will never get out of the driveway. Sure, marketing is easy if you’re rich and famous. But, what do you do if you have neither money nor reputation? Answer: gorilla marketing. You do everything you can, every day, to get the word out without cost or at low cost. Take advantage of free directory and business listings, become a social media whiz, connect on the web in as many ways as possible, link your online media together, and utilize key words to target your audience. Use community bulletin boards — in short, become visible in your business community. For example, Matt, who, coincidentally, really is fresh out of New England School of Communication, is building his business on the side while working at a local television station as an early morning news director. He loves his new job at the station; however, his passion for being behind the lens of a camera takes over in the afternoon and evening and seems to be developing into a nice little sideline for him. He can’t afford to invest in a personal domain but did a little research on the Internet and found webs.com offers a free website. Of course there are advanced levels to his website he can grow into, for a fee, to provide better visibility. Since Matt has linked his website with his social media, the simple and free site works well for now and provides a nice online presence he can refer interested parties to. Another important marketing strategy Matt uses is networking, or partnering, with other businesses offering different, yet coordinating, services to his target audience. Matt’s video and photography services compliment the limousine and DJ services he has teamed up with. This arrangement provides each business with a wider range of promotional opportunities and they all profit as a team. If you're going to spend any hard earned cash while starting a new venture, purchase good old-fashioned business cards. They’re inexpensive and a time-proven method of connecting to customers. Business cards can be dropped off at places potential clients frequent and you can also place them directly into their hands. They’re often passed around, like word of mouth. Basically, if you don’t stray from your business goals and spend your money wisely, you will reach your destination successfully, even if you hit a few bumps in the road or have to get out and push now and then along the way. Want to share your computer screen with someone in another city, state, or country? Join.Me is one of the best small business tools I've found to help get the point across -- and it's free. Join.Me is a live screen sharing program, so if you want to show someone how to use a software program, share a PowerPoint presentation, review edits to a document, run a webinar, etc., you can do it all (and share with up to 250 people) by clicking to share your screen and providing your audience with the number code you're given. Viewers simply go to the Join.Me website, enter the code, and view exactly what's happening on your screen. Join.Me also allows you to share files with viewers, chat, and enable audio during the presentation. You can get downloads to view on mobiles, as well. Join.Me does have paid Pro options for business as well (yep, it's a freemium! ), but if you don't need to switch presenters, have a meeting scheduler or international conference lines, you'll probably be fine with the free version. Need help creating a legal document for your family or small business? Get started for free with Rocket Lawyer. I just learned about Rocket Lawyer from a new client this week. The organization has a great site with tools to help you create customized legal documents of all kinds -- wills, health and medical forms, tax audit forms, real estate documents, terms of agreement, articles of incorporation, non-disclosure agreements and hundreds more. Got a quick legal question? They can offer assistance -- and if you need to find a fair rate for a lawyer in your area, they can help with that, too, because they have pre-negotiated reduced rates with local attorneys. Check it out -- and leave your comments below!